No sooner said than done. 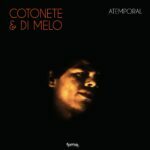 I’m a huge fan of Di Melo and had already tried to contact him for Cotonete 6 years ago. The next day, on a Sunday, he arrives at our house with Jo, his wife, and Gabi, his daughter. He takes the guitar in front of us in the kitchen, and gives us a private show of 3 hours… we cried the tears of joy.